Judge Whether you are Drinking Enough Quantity Of Water or Not. Drinking Two Glasses Of Water Before Meals Help Weigh Loss. Drinking Water is good for health. You can judge whether your water intake is sufficient or not by noticing your color or urine. 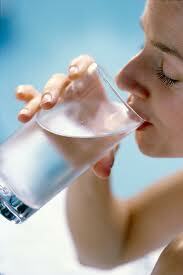 If it is colorless and odor less it means your water intake is good and sufficient and you must keep it up. Drinking two glasses of water before each meal may help you lose weight, according to a new study presented Monday at the annual meeting of the American Chemical Society in Boston. Obese dieters who drank two 8-ounce glasses of water before breakfast, lunch and dinner lost five pounds more than dieters who didn't increase their water intake. Those who drank more water also kept more of the weight off after a year, said Brenda Davy, an associate professor at Virginia Tech in Blacksburg. The study included only middle-aged and older adults between the ages of 55 and 75 who were on diet - 1,200 calories per day for women and 1,500 calories per day for men. Half of the people were told to drink 16 ounces of water before every meal. After three months, the dieters who drank water had lost an average of about 15.5 pounds, while those who didn't lost just 11 pounds.